CSR isn’t Lipstick on a Pig! #CSR is more than corporate concealer or make-up you stick on a business with ugly practices. But that’s exactly the way some organizations treat it . Then they’re surprised when they don’t see any results. CSR and #Sustainability have to be part of an integrated business strategy if they are going to work. A well-run business has a lot of integrated pieces working together and supporting each other; Finance, marketing, human resources, operations, engineering, sales, etc. CSR and sustainability are simply more pieces of the same puzzle. Individually none of these pieces will drive success on their own – but any one of them can lead to failure if not done well. Every business has its own unique mixture, its magic recipe. For some marketing may be the key differentiator that drives success. But, marketing alone can’t do it. For marketing to drive success the business needs financing, it needs good people and efficient operations and sales. In today’s business world CSR and sustainability must be part of that mix. In some businesses CSR will be the lead that drives success and competitive advantage. In others it will play a supportive role. But, it is just dumb to not include it at all, or to treat it as window dressing to cover up problems and shortcomings of the other parts. If your business has problems and shortcomings, address them. Don’t try to cover them up. Don’t try to put lipstick on a pig. CSR is sometimes seen, wrongly, as gift-wrapping for a company, used solely to project a do-gooder image to the public. As I’ve said in previous posts nobody believes that companies do anything out of the goodness of their hearts. So keeping up that phony pretense is simply pointless. And it costs you money. And it costs you goodwill. This kind of thinking will also leave your customers, employees and stakeholders wondering what else they shouldn’t trust about you. To be fair, CSR and Sustainability are relatively new issues on the business agenda. They are often brought to the table in external-facing social and environmental terms, as if they don’t really have a core business aspect to them; as if they are separate from other important business areas. That couldn’t be further from the truth. CSR does represent business value, and lots of it. Smart businesses and managers must learn how to manage that value effectively; value for society and the environment, yes, but also value and impact for the business itself. It’s important to remember that CSR doesn’t just have an external focus. The key driver is always impact. What is the impact on society, the planet, and your business. If your CSR programs are going to be effective you need to focus on all three value pillars—social, environmental, and business value—simultaneously. You can’t optimize value creation if you are constantly trying to retrofit any one of these into the equation. Right now, the default focus of CSR and Sustainability always seems to be social and environmental impact. It takes discipline and commitment to ensure that business value gets equal billing in the communications and in the strategy. Because when it doesn’t, it tends to reinforce the stereotype—that CSR is just altruistic gift-wrap, pretty but ultimately extraneous, like lipstick on a pig. And that’s just not true. It’s about business. 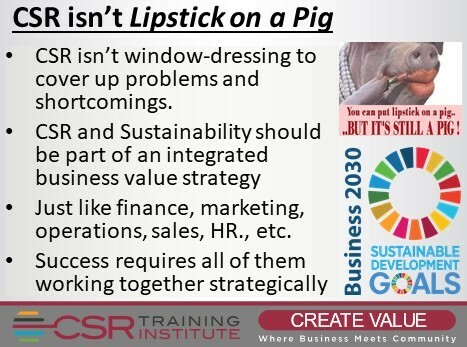 At the CSR Training Institute we have no time or interest in putting lipstick on a pig. We work with companies that want to learn to use CSR and sustainability to create real value for business society and the environment. 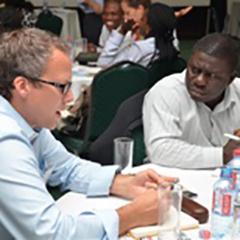 We show companies how to leverage their CSR budgets so that capital is not wasted.